You can use science to perform magic tricks and enhance any magic show. These tricks are great for use as science projects or just for fun. The "tricks" also work as memorable science demonstrations. Set money on fire and watch it burn out without damaging the bill. This is a nice magic trick based on everyday chemistry that makes a good introduction for a discussion about combustion. If you repeat the trick with paper instead of currency, the paper will burn. ... or water into blood trick, if that's how you want it. This magic trick involves changing a clear liquid into a red liquid. The magic is reversible, so you can alternate between red and clear. For this eerie science magic trick all you do is rub your fingers together. They will glow in the dark and will start to smoke. The smoke is from the vaporization of phosphorus. Although dim, the vapor also glows in the dark. Take pennies or other copper coins and make them appear to change into silver and gold.​ This trick is based on changing the chemical composition of the surface of the coin. Set a hard-boiled egg on the neck of a bottle. It won't fit! You can use science to get the egg into the bottle without destroying either one. Do you want fire you can hold in the palm of your hand? You can have it, but there is a trick to it. Note these fireballs will still be hot, but they can be held briefly. In this trick you will blow out a candle and relight it from a distance with another flame. Did you know you could do that? You can bend a stream of water without touching it. The secret of this trick is to get static electricity to move the water for you. Write a message using invisible ink and then make the message appear on blank paper as if by magic. Firebreathing is a spectacular trick in which is appears you are breathing flame. If done incorrectly, it's also extraordinarily dangerous! Fortunately, there is a non-flammable, non-toxic fuel you can use that makes this project safe enough to try. Sulfur hexafluoride is a non-toxic invisible gas that is denser than air. You can use this gas for a few different science magic tricks such as floating a paper or foil boat seemingly on air or lowering your voice (the opposite of the effect from helium). Change a blue liquid into a clear liquid and back to blue. The blue bottle trick is a classic chemistry demonstration. This is an easy magic trick that you can perform using ingredients from your kitchen. I've included an explanation of how the trick works and a link to a video so you can see what to expect. Place a ketchup packet in a bottle of water and make it rise and fall at your command, as if by magic. Of course, the magic involves some basic science. Here's how to do the diving ketchup trick and how it works. Blow out a candle by pouring a glass of 'air' onto it. This is an easy trick that demonstrates that oxygen is necessary for combustion. Take two glasses of different-colored liquids and watch the liquids switch places in the glasses. This science magic trick illustrates the different densities of liquids. This is a simple and interesting science magic trick involving fire and water. All you need is water, a glass, a plate, and a couple of matches. You can make a blue or red ink that will disappear after exposure to air. Use another chemical to make the ink reappear. You can chill water below its usual freezing point and then force it to crystallize on command. This is an example of supercooling. One of the most spectacular ways to perform this trick is to pour the supercooled water over an ice cube and watch the water freeze into ice back toward its container. Normally if you drop food coloring onto a liquid, such as milk, it will just sit there, eventually diffusing. With this trick, the colors swirl around each other as if by magic. Take multiple streams of water and tie them together with a touch of your hand! Is it magic? Actually it's surface tension. Write a message using an invisible ink. The message will be revealed by passing a flame over the paper, causing the secret to burn away. Except for the message, the paper won't burn. Dip forceps into a layered liquid and pull out an ever-growing rope of nylon fiber as it polymerizes from the reaction between the two chemicals. Pull a length of wire through an ice cube, without cutting the ice cube in half! This trick relies on the phenomenon known as regelation, which allows the wire to cut the ice and refreezes the ice cube behind it. Light a candle, blow it out and then eat the candle! The basis for this science trick is using a food that looks and burns like an ordinary candle wick. The candle itself is food that looks like a wax candle. Cut out a ghost shape from a piece of paper and make it dance in the air, as if by magic. This is a simple trick, where static electricity makes paper move. The ghost shape is perfect for Halloween, but you can use any shape. Heat together two common chemicals to fill the air with the odor of violets. 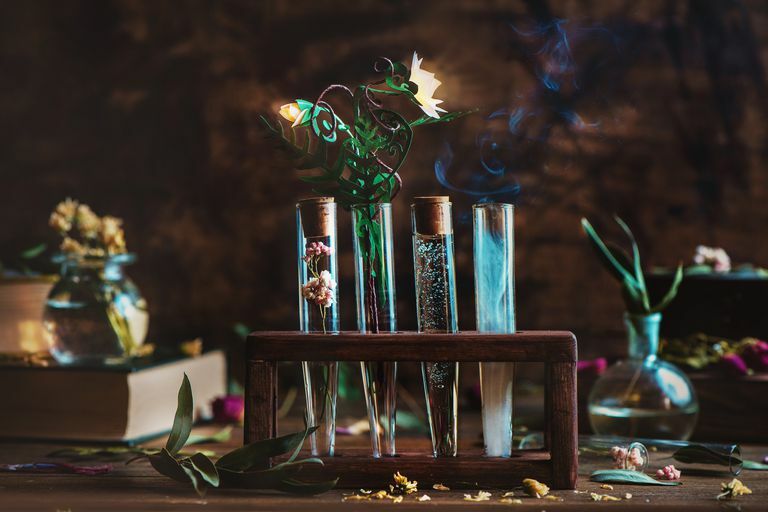 This trick is interesting not just because of the odor that is produced, but because this chemical 'comes and goes' in human awareness, so you'll smell the violets, the odor will vanish, and then it will return. Throw boiling water into the air and watch it instantly turn into snow! Usually, all you get is boiling water in the air, but if you have a really cold winter day, the water falls as snow.